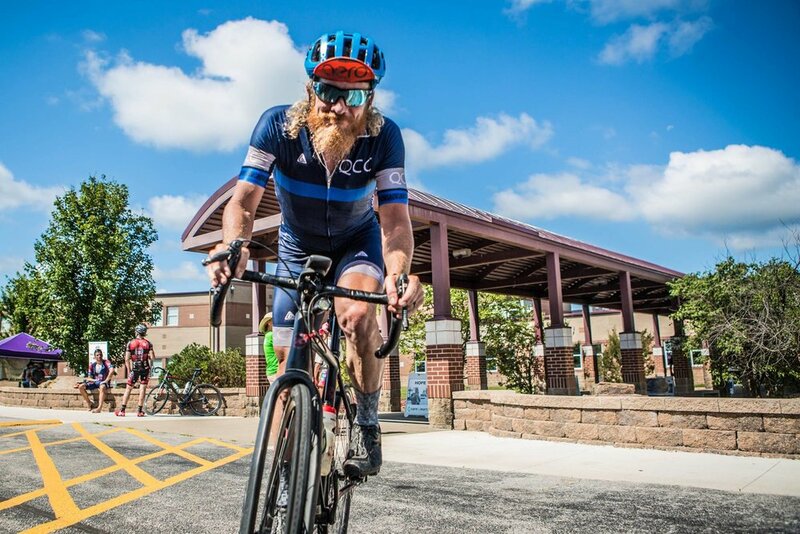 If you have been in Springfield’s bicycle scene for any time at all, then you probably have met or at least heard of endurance bike legend Jim Phillips. Jim is a bit of a man of mystery. Quiet and somewhat humble, he does not talk about his life much. Few people know that years before selling his jeep for a bicycle and taking up riding 10,000 plus miles every year, Jim had an exciting past. From ultra runner, rock climber, professional skydiver, and Marine - Jim has done it all. When not spending time on his bike he has a small farm of chickens and dogs to tend to as well as a teenage son to keep him on his toes. Here are some quick off the cuff questions that might help you get to know Jim a little bit better. So a lot of people may not know about “Jimmyonyourback”, as Neil states. Care to tell us where jimonyourback comes from? In a past life I was a tandem skydiving instructor. One woman I took on a jump was pretty stoked by the experience and later had a t-shirt made for me that said “strap a wild man on your back.” Shortly after getting that shirt I had to choose a name for a web forum and Jimonyourback came to mind. You are becoming known for your riding poetry. Where do you find the inspiration to the poem you choose for the next viral video? They have come from different sources. The most popular video was the Dirty Kanza Walt Whitman poem that was suggested by a friend, Don Buttram. The first video I made was an E.E. Cummings poem my nephew had me read when I officiated his marriage. I shot the video on a bike ride to practice reading the poem for the wedding and posted it to Facebook and everybody seemed to like it, so I’ve made more. Less exciting stuff now: what is your current set up and current sponsors? I’m fortunate to ride for Kuat Racks Gravel Team. Kuat is a local Springfield company that gives tons of support back to the cycling community. I'm also an ambassador for Lauf and Cantu so I ride a Lauf True Grit Race bike with Cantu Rova wheels. It is the sweetest bike I have ever had the pleasure to ride. But the best bike in the world is the one you ride every day. Your current day job is? Your dream job would be? I push paper for a local law firm. My dream job would be no job, but we all got bills to pay. Many people don’t know that you have also run a few Ultras, what is your longest Ultra? The Ozark Trail 100 in 2013 was the last really long run. It’s actually 103 miles. That was a 28 hour adventure. It has almost been long enough for me to start thinking about doing another long run. Events that take more than 24 hours are the best, bike or foot. Something about being focused on the training for months before, and then being up all day and night committed to a singular task… it’s refreshing for the soul. Your looks are almost as legendary as you are, maybe it is part of the total legend. What comes to mind is the beard and hair. Ever thought about shocking the nation and shaving it off? No. First and foremost, my partner in life, Sara, likes it. I had a short military cut and clean shave for a long time. After many years of weekly haircuts and daily shaving, one day I had just had enough. Now I just let nature take its course. One of the surprising things that seem to shock people more then you being a former skydiver with thousands of jumps is that you were once a Marine. What years did you serve, what countries did you travel to, and what was your rank at the end of your service? I was active duty from 1992-96 with the 3rd Light Armored Reconnaissance Battalion. I traveled a good bit. I saw the Middle East, the Far East, Africa and Australia. I got out as an E5. Being a Sergeant in the infantry is where I learned I don't really care to be in the leadership role. I like pushing myself but don’t enjoy pushing others. It has been rumored that you are a secret junk food eater. Any truth to the rumor, and if so what is your favorite processed food product? I’m working really hard at changing that part of myself. If I didn’t do so much cardio I would weigh 400lbs. I don’t like picking favorites in life as there are so many amazing things to experience, but soft drinks, chocolate, and potato chips have all played large roles in my life. I have finally kicked the soda habit. Ok, the world wants to know: have you ever seen Collin Little not smiling and if so can you recall why he was not? My teammate Collin has one of the most enduring smiles I have ever came across. I sometimes fantasize that when I finally beat him in a race, he won’t be smiling, but he probably will be. This interview was conducted by Joseph Thomas. Photos provided by Jim Phillips.